Draft: 2015, St. Louis Cardinals, SUPth rd. Graduated from Cypress Creek (Texas) High School...Signed his letter of intent to play college baseball at Tulane University...Was recipient of the Joe Ostermeier/Jack Herman Rookie of the Year award for 2018 at the St. Louis BBWAA Awards Dinner along with Jack Flaherty, Harrison Bader, Yairo Muñoz and manager Mike Shildt...Resides in Houston, Texas. 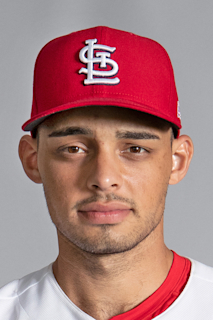 Made Cardinals Opening Day roster out of Spring Training as a 21-year old, previously not pitching higher than Class-A (Palm Beach)...Made MLB debut on Opening Day at NYM (3/29) pitching a scoreless 7th, recording a double play and striking out Jay Bruce...Posted his first Major League victory vs. CIN (4/21) with a career-high 2.1 scoreless innings...Appeared in team-high 73 games, ranking T-8th among National League pitchers and was the 5th-most by a Cardinals rookie...Recorded 25 Holds, ranking T-5th among National League relief pitchers...Owned the highest average velocity in MLB with his fourseam fastball (100.5 MPH) & two-seam fastball (100.2 MPH), and 2nd-fastest sinker (100.4 MPH), according to Statcast rankings...Led MLB with 659 pitches thrown of 100 mph or faster (51.7% of pitches); with Miami's Tayron Guerrero ranking a distant 2nd with 197...Threw the three fastest pitches in MLB in 2018 (105.1 MPH sinker & 105.0 MPH sinker vs. PHI 5/20 facing Odúbel Herrera; 104.4 MPH sinker at ARI 7/4 facing A.J. Pollock) and 7-of-the-10 fastest pitches (all 104.1+ MPH)...Pitched on consecutive days 15 times and on three straight days only once (June 7-9)...Led the Cardinals with 34 inherited runners, allowing 10 to score (29.4%)...Faced 339 total batters, 2nd-most among National League relievers (Gsellman, NYM, 342) and most by a Cardinals rookie reliever since John Frascatore (348 in 1997)...Ranked among NL relief leaders in innings (77.2, T-6th), ground ball percentage (61.7%, 5th) and opponent GIDP's (12, 7th)...Held the opposition to a .257 slugging percentage with only nine extra base hits allowed...Surrendered only two home runs on the season (both to LHB; Jason Heyward 6/16 vs. CHI & Jeimer Candelario 9/7 at DET) averaging 0.23 home runs/9 IP, 4th-best total among N.L. relief pitchers...Limited opposing right-handed batters to just three extrabase hits (all doubles)...His .171 opponent slugging pct. vs. RHB was 2nd-lowest in the NL and the lowest all-time in Cardinals single-season history (min. 100 batters faced)...Led all Cardinals relief pitchers with 70 strikeouts; 6th-most by a Cardinals rookie relief pitcher...His seven blown save opportunities ranked T-3rd in the National League (Boxberger & Bradley - 8) and were 2nd-most by a Cardinals rookie trailing Todd Worrell (10 in 1986)...Made seven relief appearances of 2.0 or more innings, tied for the team lead...Blanked the Dodgers for 2.0 IP on 9/16, throwing single-game high 34 pitches in lone appearance of homestand. Did not pitch in the Pittsburgh series (9/10-9/12), the first time all season he did not appear in a 3-or 4-game series...His 102.1 MPH pitch to Jeimer Candelario (DET) was the fastest hit for a home run in MLB in 2018 ( Statcast )...Struck out a season-high four batters twice (5/29 at MIL & 6/12 vs. SD), tied for most by a Cardinals reliever in 2018...His six saves at age 22 or younger were the 2nd-most by a Cardinal trailing only 22-year old Chris Perez with seven in 2008...Began his career with 31 outings (35.0 IP) without allowing a home run before June 16, surrendering a two-run home run to Jason Heyward (first pitch of AB) in the 8th inning...longest streak by a Cardinal since Jason Motte (37 G, 33.2 IP)...Tied for the Major League lead with seven Holds in the month of August (Dakota Hudson, Steve Cishek, Taylor Rogers)...Appeared in a season-high 14 games in the month of May, T-4th most among National League pitchers...Struck out a season-high 18 batters in the month of June, T-6th most among National League relievers...Pitched 48.0 innings prior to the All-Star Break, T-7th among National League relievers with Josh Hader (MIL)...Became the 3rd-youngest Cardinal in franchise history and first since Rick Ankiel (20.076, 10/3/99 vs. CHI) to earn a save (at CIN, 6/9), the first of his career...Had a 101.5 MPH two-seam fastball fouled off the bat of Kris Bryant injuring Yadier Molina in the 9th vs. CHI (5/5)...Recognized as having the "Best Fastball" in the National League by managers, coaches, scouts and executives in Baseball America 's 2018 "Best Tools" survey following the season. Appeared in 22 games (19 starts) between Peoria (A) and Palm Beach (A). Last three appearances of the season all came in relief at Palm Beach (5.0 IP, 0 R, 8 K)... Named to the Midwest League Mid-Season All-Star Team. Pitched two-thirds of an inning (4th) for the West Squad and struck out both batters faced recording a Hold... Named Cardinals Minor League Pitcher of the Month for July, going 1-1 with a 1.08 ERA and 30 strikeouts in 25.0 IP... Struck out a career-high nine batters in his final start for Peoria (A) at Kane County (7/2), tossing a career-high 8.0 scoreless innings of four-hit ball in a win... Led Peoria by inducing 13 double plays despite not making a start past July 2... Ranked 2nd in the Midwest League in hit batsmen (13)... Did not allow a run in his last seven appearances of the season, including four starts, covering 22.0 innings... Did not surrender a home run in his last 51.2 innings pitched to finish the season... Recorded his first professional save vs. Bradenton (8/19)... Member of the 2017 Palm Beach Florida State League co-Champions team (Championship Series canceled due to Hurricane Irma), but did not pitch in the playoffs... Appeared in nine games for Surprise in the Arizona Fall League striking out 16 in 15.2 IP... Rated as the No. 6 prospect in the Cardinals organization by Baseball America following the season. March 28, 2018 St. Louis Cardinals selected the contract of RHP Jordan Hicks from Springfield Cardinals. February 7, 2018 St. Louis Cardinals invited non-roster RHP Jordan Hicks to spring training. September 26, 2017 Springfield Cardinals activated RHP Jordan Hicks from the 7-day disabled list. August 29, 2017 Springfield Cardinals placed RHP Jordan Hicks on the 7-day disabled list retroactive to August 28, 2017. August 25, 2017 RHP Jordan Hicks assigned to Springfield Cardinals from Palm Beach Cardinals. July 12, 2017 RHP Jordan Hicks assigned to Palm Beach Cardinals from Peoria Chiefs. April 2, 2017 RHP Jordan Hicks assigned to Peoria Chiefs from State College Spikes. March 13, 2017 RHP Jordan Hicks assigned to St. Louis Cardinals. July 31, 2016 RHP Jordan Hicks assigned to State College Spikes from Johnson City Cardinals. June 22, 2016 RHP Jordan Hicks assigned to Johnson City Cardinals from GCL Cardinals. June 22, 2015 RHP Jordan Hicks assigned to GCL Cardinals. June 15, 2015 St. Louis Cardinals signed RHP Jordan Hicks.